Darren Bazin demonstrates how to build a concave front shoe from 13.5 inches of 7/8 x 7/16 inch fullered concave steel, hammer finished. 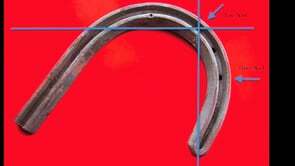 This style of shoe is commenly used on riding and sport horses. This shoe forms part of the element 1.3 of the National Occupational Standards in the UK.Running time 9m 29secs. To access this content, you must purchase Site membership, or log in if you are a member.